Marilyn I. (Clark) Nolan was the daughter of the late David T. Clark and Eliza J. (Whitman) Clark of West Springfield. Marilyn was a 1964 graduate of West Springfield High School and a 1966 graduate of Holyoke Community College. She also attended Westfield State College. She worked at Berkshire Industries in Westfield for over thirty-five years until she retired in 2011. She was also a life-long member of St. Thomas the Apostle Parish in West Springfield. 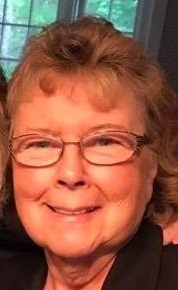 She was a lifelong resident of West Springfield where she leaves behind her husband, Robert M. Nolan, two children and four grandchildren. Her son, David C. Nolan and his wife Rosealyn of Wellesley along with their two children, Sofia and Teagan. Her daughter, Andrea I. Schmidt and husband David along with their two children, Jacob and Brenden. Her four grandchildren brought her great joy and she loved and adored them more and more each day. She is predeceased by her sister, Ellen J. VonHone Maranda of Yarmouthport, MA. Marilyn will be dearly missed by all who knew her. The Funeral will be Saturday at 9am from the Toomey-O’Brien Funeral Home with a Funeral Mass at 10am at St. Thomas the Apostle Church followed by the burial at St. Thomas Cemetery. Calling hours will be Friday 4 – 7pm at the TOOMEY-O’BRIEN FUNERAL HOME, 1043 Westfield St., West Springfield. In lieu of flowers, donations can be made to the American Cancer Society, P.O. Box 42040, Oklahoma City, OK 73123 or www.cancer.org. For more information please visit www.toomeyobrien.com.